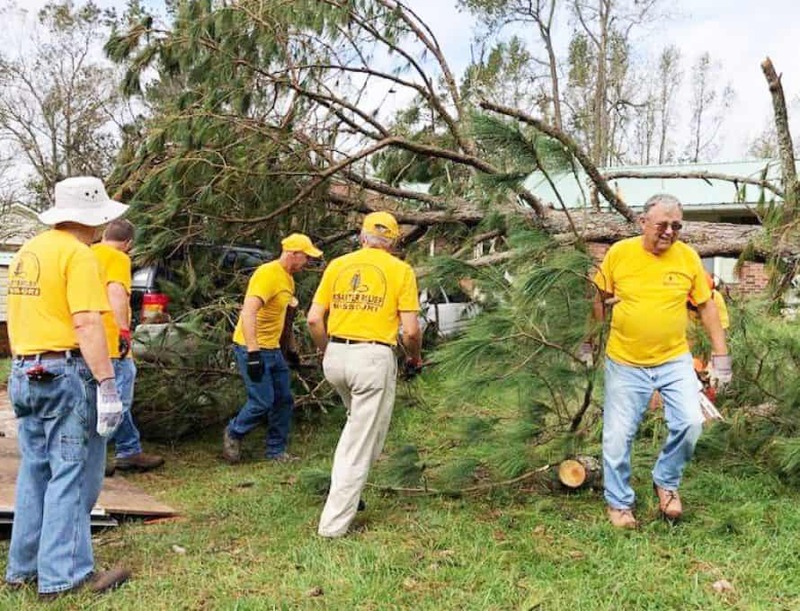 WALLACE, N.C. – Missouri Baptists are hard at work clearing property and cleaning homes for survivors of Hurricane Florence. To date, Missouri DR workers have put in nearly 20,000 volunteer hours in North Carolina. Photo by Missouri Baptist Disaster Relief. WALLACE, N.C. – It hasn’t necessarily dominated the national headlines, but the scope of Hurricane Florence’s impact on the east coast – North Carolina, in particular – has been massive. It may have been downgraded to a Category 1 storm, but the U.S. Geological Survey says the storm still dumped more than 18 trillion – yes, trillion with a T – gallons of water. Fortunately, the flooding rivers and creeks were also met with a flood of aid, including dozens of Missouri Baptist Disaster Relief volunteers working to bring help, hope and healing at no cost to North Carolinians. Since a convoy of trucks and trailers left Missouri and headed east Sept. 16, MBC DR volunteers have worked more than 170,000 hours. And while the flood waters have receded, the need for volunteers has not. 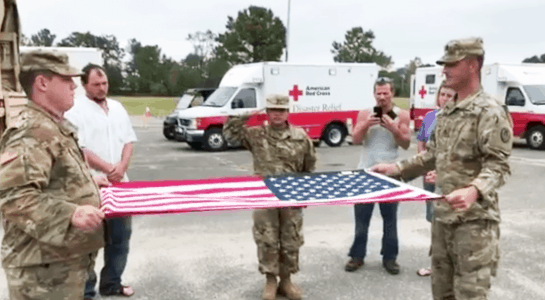 WALLACE, N.C. – When a Missouri Baptist Disaster Relief volunteer heard that the military service memorial flag honoring a Hurricane Florence survivor’s father was “the most precious item lost to the flooding,” the volunteer worked with the North Carolina National Guard to replace it. Gaylon Moss, the director of Missouri Baptist Disaster Relief and himself a recent transplant from North Carolina, said he sees the response continuing through the end of October, but it all depends on volunteer’s schedules and availability. Based out of Poston Baptist, First Baptist and Island Creek Baptist Church in Wallace, Missouri volunteers first focused on feeding residents without power – cooking upwards of 4,000 meals a day. 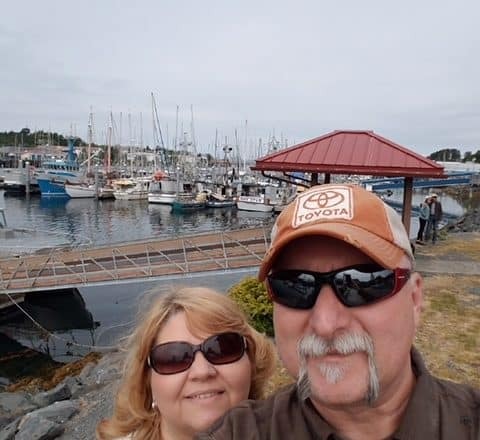 Mobile shower and laundry trailers and volunteers helped keep residents and first responders fresh as they went about their long shifts, and chaplains are on site available to anyone who needs a friendly ear to talk to. The effort has since shifted to focus purely on recovery: removing trailers and trailers of soaked debris and installing temporary roofs. Trained and untrained volunteers are welcome to come work. Those interested may call Incident Command Planning at 573-556-0320. Volunteers pay their own expenses when responding to a disaster, but the cost of equipment and materials for feeding and recovering can be overwhelming. One hundred percent of donations to Missouri Baptist Disaster Relief go directly to disaster response. Donations can be made online at mobaptist.org/disaster-relief-donation.